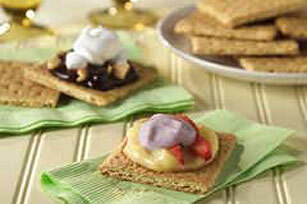 Pudding, fruit, marshmallows and nuts are served on sweet graham crackers and topped with yogurt in this fun, nacho-style dessert. Spread each graham square with 1 Tbsp. pudding. Cover with fruit, marshmallows and raisins. Top each with a spoonful of yogurt or COOL WHIP. Serve these colorful nachos as individual snacks or prepared in quantity to share with family and friends. Make it a fiesta by serving on brightly colored plates and napkins.